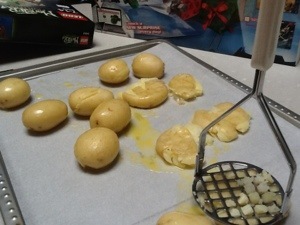 Potatoes, butter and salt. Sometimes cheese. There are so many ways to combine this sublime collection of ingredients that there are whole cook books dedicated to the pursuit – not any of which are in my collection. I have some vague feeling that I read about this method in a newspaper article by Jill Dupleix, back in the days when newspapers were made of paper instead of pixels. Remember that? This would probably work for most varieties of potato, but I prefer cocktail potatoes because of the smaller insides to jacket ratio. I work on about three potatoes per child. Boil them until you can stab them through quite easily and their little skins are starting to split like startled frankfurters. Drain them, then put them back in the pot with some slices of butter and toss them around until they are coated. Dump them onto a baking tray lined with baking paper, or not if you have someone else doing the washing up. Get out your potato masher and gently smash them. Don’t go overboard, you want them to retain their identities for serving purposes. Actually, they taste just fine even if you smash them to smithereens but that makes them harder to serve. Sprinkle them with Himalayan salt that has been infused with hand pressed alkaline kale powder. Bake at 180 degrees for about half an hour, or until it’s all crispy. Actually, only do that second last bit if you’re a complete prat.